As mentioned earlier this year, one of the ways we’re celebrating the Inn on Mill Creek’s 10th birthday in 2009 is to assist with microloans to 10 entrepreneurs through Kiva. Helping small business owners in developing countries is something we’ve been doing since we became small business owners ourselves in 2007. It’s a way for us to connect with other individuals who run their own businesses, and to help with the fight against global poverty — a cause that’s important to us personally.Our first loan in 2009 was used by 25-year-old Eusebia to improve her store in Peru. Our second loan is currently helping Mavjuda to expand her clothing store business in Tajikistan. Both businesswomen are currently paying back their loans.As a business owner pays back his or her loan through Kiva, one of the options that lenders have is to re-loan their money to a new entrepreneur, which is what we are doing. For example, Nilton, a small business owner and farmer in Peru who needed a loan to open an agricultural consultant’s office to help other farmers in his hometown, has paid back his entire loan to us and his other lenders. 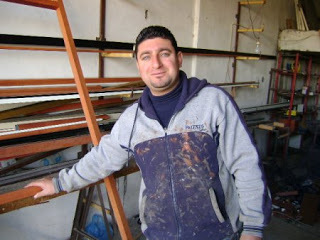 We have now put the money we lent to Nilton toward a microloan for Ali, a 27-year-old married father of two in Lebanon who wants to expand his metal shop. Ali has been installing aluminum for 10 years (his entire adult life) and we’re excited to help him grow his business and his local economy, and become a positive force in his community.You can find out more about our efforts with Kiva on our Inn Turns 10! web page: www.innonmillcreek.com/innturns10.htm#kiva. Next month, we’ll talk about our fourth entreprenuer who hails from a town in Honduras.